A period historical drama about Sigmund Freud and Carl Jung seems light-years removed from the horror/sci-fi hybrids David Cronenberg made early in his career. In reality, though, A DANGEROUS METHOD deals with many of the same thematic issues the Canadian director has been examining his entire career, notably repression and evolution. As Jung (Michael Fassbender) uses “the talking cure” (Sigmund Freud's then new psychoanalysis) to treat the seemingly mad Sabina Spielrein (Keira Knightley), it's hard not to draw comparisons to Oliver Reed and Samantha Eggar in THE BROOD. Sabina doesn't give birth to literal monsters as Eggar did, but Jung must nonetheless deal with the repercussions of making his patient externalize her neuroses. Beyond that, Jung also seems hopeful that psychoanalysis can be used to help his patients overcome who they are and become the people they were meant to be. Not so much the “new flesh” of VIDEODROME as a “new psyche”. 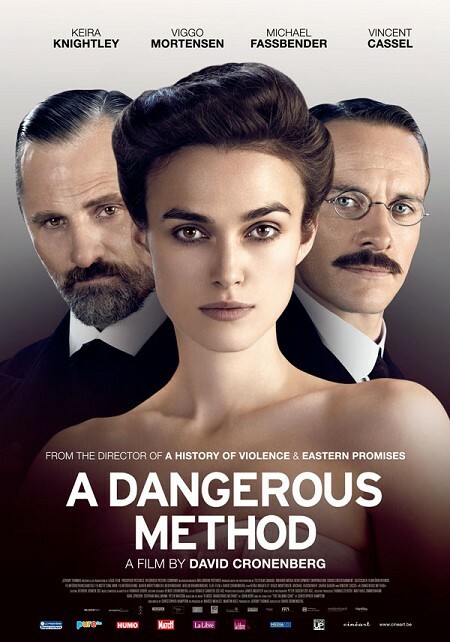 A DANGEROUS METHOD is set during the early days of psychiatry, when Freud 's (Vigo Mortensen) theories were greeted with outrage as much for their emphasis on sexuality as the driving force of everything in human life as for any scientific shortcomings. Jung was an early convert to Freud's ideas, despite some areas of disagreement, and when the two men meet after Spielrein has been cured a complicated surrogate father/son relationship develops. Freud is aware that his theories are in their infancy, describing himself as akin to Christopher Columbus: he's discovered a new continent, but he has no idea what that continent is. And yet, despite this seeming humility, he is extremely sensitive to criticism, surrounding himself with sychophants and yes-men. And Jung, despite his admiration for Freud, is definitely not a yes-man. The other key relationship at play is between Jung and Spielrein. From early on, there is clearly sexual attraction between doctor and patient. At first, Jung resists for the sake of his marriage to Emma (Sarah Gadon), but inevitably he gives in, leading to guilt and deception. Jung's relationship with Freud is no less complicated. Freud is dismissive of Jung's interest in the paranormal and his efforts to relate it to his psychological theories, and the class differences between the two men creates problems as well. As I always say when I review any film “based on a true story”, you should probably take A DANGEROUS METHOD with a grain of salt. This is a dramatization and distillation of a chapter in history that has been tailored to fit Cronenberg's particular areas of interest. Therefore it's no surprise that he pays more attention to the sadomasochistic affair between Freud and Spielrein than some might say it deserves. These ideas of repression and release are central to Cronenberg as a filmmaker, and they are also central to the work of his film's subjects. So even if not everything on screen is THE truth, it gets at A truth that is relevant to all concerned. My biggest problem with the film is the way it juggles its subplots. Even though Cronenberg manages to keep the running time at just around an hour and a half without losing any pertinent information, there's something about the flow of the movie that feels a little off to me, resulting in a movie that feels longer than it really is. Just as we're really diving into the relationship between Jung and Spielrein, the movie switches gears to Freud, or takes a detour where Jung treats a fellow psychiatrist who has completely freed himself of all inhibitions (Vincent Cassell). Jung's wife disappears for large portions of the film, at times making you wonder (if, like me, you didn't know the actual history going in) if he is still married or not. All this material should be in the film, but at times the way it's inserted feels awkward. In the end, though, that's a fairly minor complaint, and while it's not one of Cronenberg's best, A DANGEROUS METHOD is still pretty damn good. 3 out of 4 stars.